Use Advanced Search Closing Type to search Jobs & Job Templates by options To Invoice, Overhaul or To Stock 148. When a Job is Invoiced the Job General Tab Division field will automatically lock. The Invoice created also has a locked Division field. The Invoice must have the same division as the job for the financial reporting. If a Job has been Invoiced with the incorrect Division all line items must be removed from the Invoice and the Job General Tab Division field will unlock. 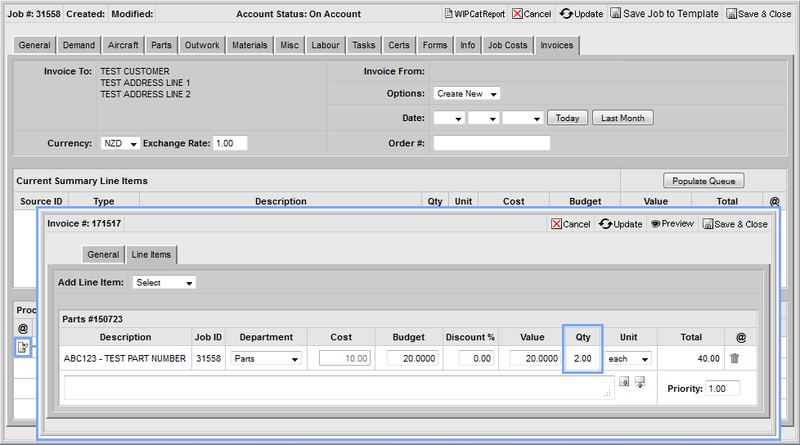 Any parts that are invoiced via Job Invoices Tab can no longer have the quantity amended directly on the invoice. 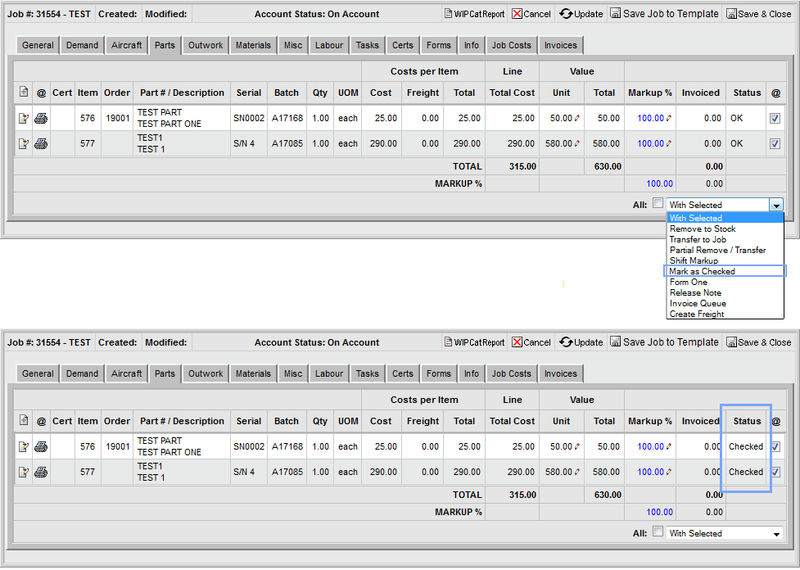 If there is a quantity error the line must be removed from the invoice, the quantity can then be corrected on the Job Parts Tab and then added back onto the invoice. If partial quantities of items issued to jobs need to be returned to stock simply tick the item and select "Partial Remove/Transfer" from the drop down menu. Enter the quantity to remove and select "Remove to stock". If partial quantities of items issued to jobs need to be transferred to a different job simply tick the item and select "Partial Remove/Transfer" from the drop down menu. 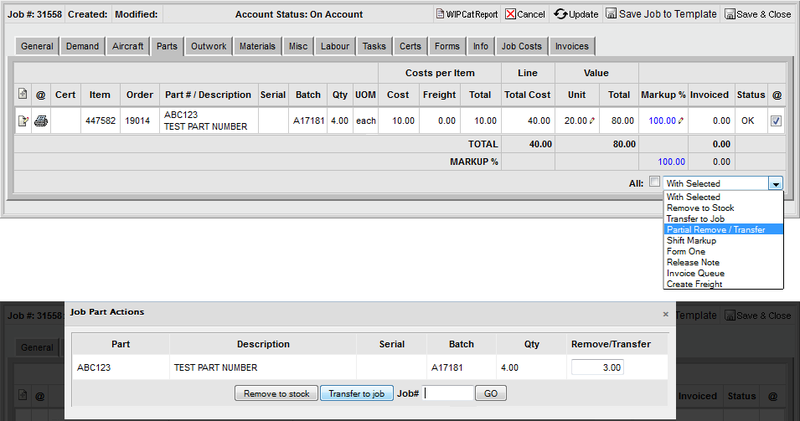 Enter the quantity to transfer and select "Transfer to job". Type the new job number and select "Go". Fixed headers have been introduced to even more modules in this release. The Job Demand Tab results can be viewed by using the vertical scroll bar on the right or drag the bottom border of the field to enlarge and display more lines. The Job Parts Tab also has fixed headers and a new simplified layout. To view Job Info Notes simply hover over the Job Name / Description field. This drop down has been changed to a text field so the Aircraft Registration can be typed and simply select from the options available. When Job Type "Overhaul" is selected the Job Invoice Tab will be automatically be renamed Stock Details Tab. Populate queue, create items then receive the items into stock directly on the Stock Details Tab using the Receive To Stock Icon. Jobs can now have line items set to "Checked" as costs & values are confirmed. Each tab has the option to set the line items to "Checked". See how the job is progressing by viewing the percentage checked column on the Jobs Module Display. Simply click on the ... icon to calculate the percentage of the job that has been checked. Create a new batch number directly on the TD General Tab. The Job Summary Report is located on the Job General Tab. This report is a summary of the entire Job - Parts Demand, Parts Issued, Outwork, Materials, Misc, Labour & Tasks. There are no costs or values on this report making it suitable for all users. Easily review what has been invoiced, what is still on order and what needs following up. If due dates are within the next 5 days they will display BLUE and if due dates are overdue they will display RED.